You can request a price quote and a free viewing by calling 020 3746 3201 or submitting an online request. Better Cleaning Company is an expert cleaning and junk removal company in Greater London with a very fine technique to each individual client. We are always dedicated to the personal needs and requirements a customer comes to us with. This is the reason why our removal services are always so effective and highly rated. Planning removal for you will be fully conducted to your deadlines, wishes and administrative demands. We definitely will pack the luggage for you and we will give you even the packing supplies. We will find man and van for the transport and will be very aware for your personal belongings - especially for fine art, important items, decorative furniture and hand-made indoor goods. In all circumstances we secure not only the packing procedure, but also the right packing containers set up during the traveling. If you want personal travel support - like tickets, temporarily accommodation or administrative assistance with the removal, we can help you, too. We are set up to deliver a fast, hassle free garden waste collection Greater London SE service any day of the year. Our rubbish collectors will arrive with a van and all the tools necessary to gather, load up and dispose of your garden waste. That comprises green waste removal, brown waste removal, leaves, branches, twigs, trees, hedge or grass cuttings, and also garden waste recycling. If you are having problems cleaning out and disposing of the leftover builders waste following the reconstruction of your house, we are 7/7 ready to assist you. We provide high quality building waste removal Greater London SE in accordance to all regulations. Our waste disposal staff will perform all the heavy lifting and loading, and could be very useful for bulky waste clearance and all kind of renovation debris removal. 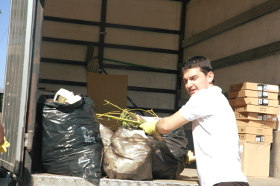 Our staff are vetted and qualified to safely deal with your rubbish. They will show up with a van for loading and carrying the builders waste to the disposal site. We will recycle as much of your waste as possible. For swift and efficient assistance in clearing out excess things and rubbish from your house, get our professional waste disposal service right now! If you decide to reserve our top quality rubbish removal services Greater London SE, you should contact our 24-7 phone line 020 3746 3201 or send an online booking form for a free viewing or perhaps directly buying our service. Better Cleaning Company guarantees a quick arrival of our experienced 2 men teams at your property. They will inspect the volume of the waste materials, and will offer you a price estimate right then. Loading & collection will commence immediately after that. As a licensed rubbish waste carrier we always do the recycling on your behalf.